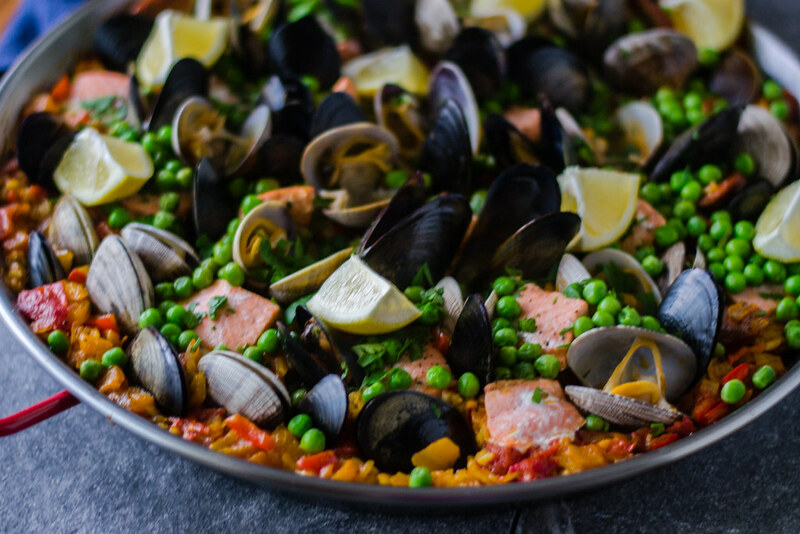 So many cool things are happening, including my seafood and chorizo paella of course. I’ve teased you a bit on my Instagram stories (P.S…my new favorite app, ever!) and I plan on doing more personalized stories too. If you don’t already, you can find me on Instagram as FerraroKitchen. So long story short, this year has been insanely awesome. Stressful,, anxious, but overall a fabulous learning experience. When we moved here a year ago, our plan was to buy a house within a year. And as fate has it and without even realizing, we put an offer on a house exactly a year to the day we moved. Crazy how fate works right? We’re still about 2 weeks away until the closing and there’s still a lot to do on the seller’s side so we’re being optimistic everything will get done in time. Then after that we settle, work on earning some more money and continue onto house updates. I’m also planning on blogging about all the house updates and just the overall experience we’ve had…interested? Now let’s chat paella. Most of the ingredients sourced are from local companies…fabulous isn’t it? The mussels and clams are from Taylor Shellfish Farm which is just about 15 minutes away and has been featured on the Travel Channel numerous times. Go there on a summer day and shuck your oysters right by the water, there is nothing like it. The salmon is from my friends over at Alaska Gold Seafood, not exactly local, but their office is based here in Bellingham and their salmon is wild line-caught and Kosher certified. Chorizo is from the best local butcher shop ever, Carne here in Bellingham. Picture old school, simple, white walls and glass cases full of meat. All pasture raised and local, you definitely get what you pay for. None of this was sponsored, I just absolutely love the local business scene here. And that’s what makes this paella so delicious and so special. 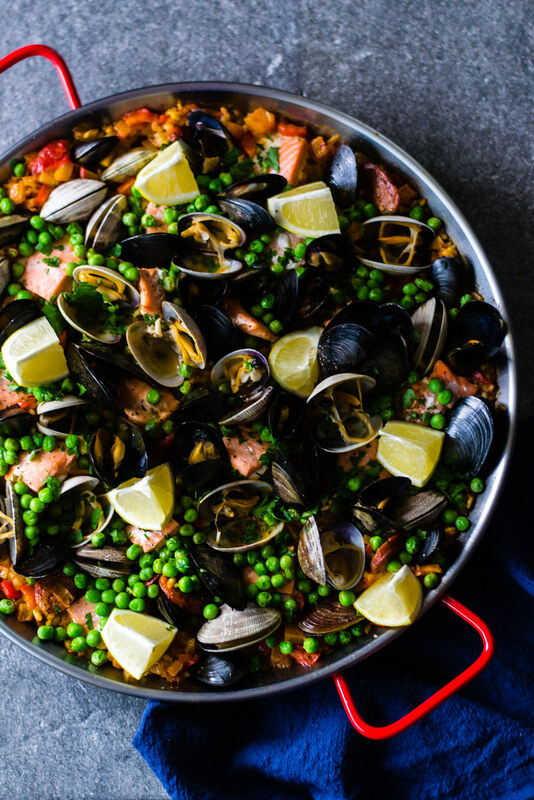 A few tips on paella making; don’t overcrowd the pan as it cooks and make sure you have even heating all around. Because my burner had a hot spot, I kept a close eye on it and covered it for even cooking, so just be aware. Likewise, layer ingredients in stages. The mussels and clams cook quickly so that’s usually the last thing I add, but the chorizo is one of the first since it has to cook a lot longer. It’s all about that layering action. Before cooking, clean the mussels and clams. I leave them in a bowl of cold water and allow them to sit for at least 20 minutes to get all the sand out. Then use a brush or scrubber (those potato ones are great) and scrub all the shells of any outside dirt. For the mussels, there's a little "beard" that holds them together, using a pairing knife, pull that out. Leave the shellfish over ice, chilled until ready to use. Next heat your paella pan and drizzle with olive oil on medium-high heat. Add the chopped onions, and peppers and saute until just tender, about 2-3 minutes. Then add the chorizo and chopped garlic and and continue cooking for another 1-2 minutes until the garlic is carmelized and chorizo has a nice deep golden color. You may want to turn the sausage so both sides get a good sear. Next add in the tomatoes with their juices and paprika and saffron. Bring to a gentle simmer and allow the liquid to evaporate slightly so the tomatoes concentrate. Add the dried rice and toss the rice into the liquid and all the other flavors, making sure everything is coated evenly then use your spatula to spread the rice and everything else evenly around the pan. Add stock and white wine and bring everything to a simmer for about 20 minutes. Check the pan every so often, making sure the hot spots aren't cooking faster, you may need to turn the pan every so often. Once the rice is about half way cooked, add the salmon around the pan and continue cooking for another 10 minutes (You may need to cover with foil for even cooking). Then add the clams and mussels and cook for another 10-12 minutes until they open up. I nestle the shellfish into the liquid making sure it gets enough cooking. Once all fish is cooked, turn off heat and add peas and garnish with lemon and parsley. For those who love seafood as much as I do, here is some more seafood cooking inspiration. 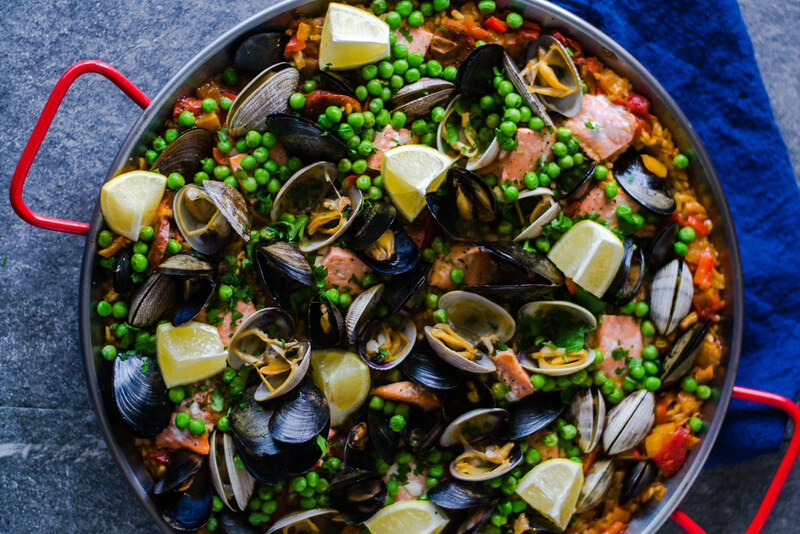 I love Paella especially those with generous portions of seafood on them like yours. We make it using prawns and mussels, but will try salmon and clams next time. I love paella so much and love mussels as well!! Yes try the salmon for sure! Thank you for your tips in paella-making and I agree that we should not overcrowd the pan. Also, I remembered the first time I cooked paella, the mussels were overcooked. It was sad. 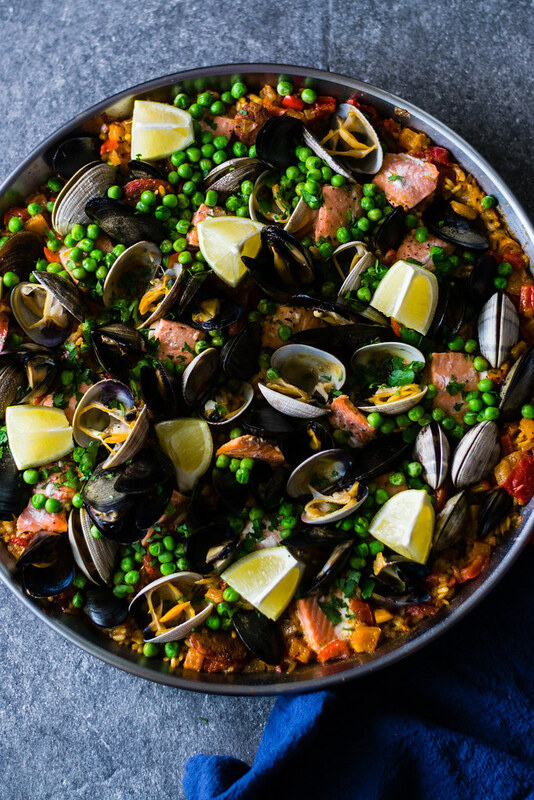 Definitely, looking forward to trying this seafood paella with chorizo. Thanks Sheila!! Hope you do..it’s all about the layers and the mussels are my favorite part!! I love seafood. Thanks for sharing this amazing recipe. Thank you for commenting Kristy! It’s really great recipe for cooking. I love paella. Thank you for shear my favorite recipe. WOW, This is very delicious and healthy food recipe. I love seafood. I eat more time this food. Thank you for share amazing post.